This post was originally published by StitchTLC ChiefChange Agent Jim Wardlaw. At a recent quarterly meeting with my fellow EOS Implementers I quickly sketched out an illustration of a tool upon which I often rely to help my clients understand where EOS fits into the range of professional support resources available to them as business owners. Before I go on I want to give credit where credit is due and thank Jonathan B. Smith for inspiring this insight. 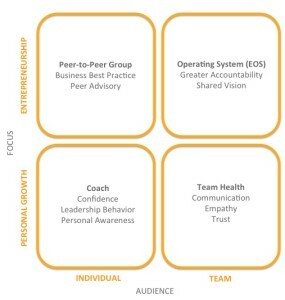 His recently published book Optimize for Growth and the O4G Model described therein does a fantastic job making a case for leaders seeking the support and guidance of a coach, peer group and operating system. His work is solid and thoughtful; a must read for any business owner looking for a sound structure for growth. I encourage everyone to consider picking up a copy (www.chiefoptimizer.com/optimize-for-growth). As an old marketing guy, it’s hard to resist the opportunity to extend the O4G Model into a positioning conversation about EOS. Positioning, for those less familiar with the concept, is the idea that a brand holds a unique place, or “position,” in the mind of the marketplace relative to its competitors – that EOS is uniquely compelling and relevant among other competing services. 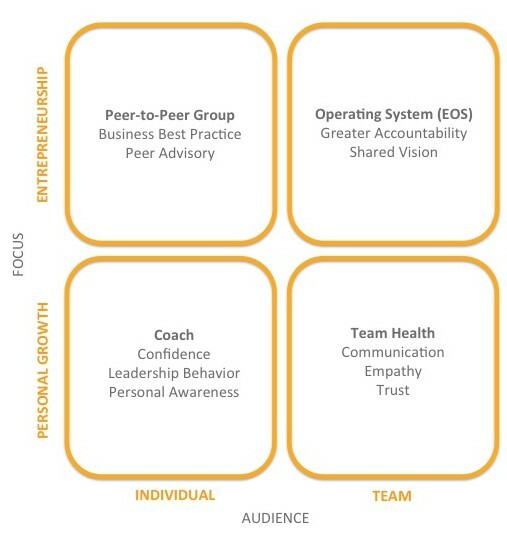 If we consider the elements of the O4G model from this perspective we can get some clarity around the specific needs met by each area of service. Above, I have illustrated the axes of a two-by-two: Focus, divided into Personal Growth(the work you do on yourself) and Entrepreneurship (the work you do on your business) and Audience divided by Individual and Team. Pairing the various combinations of Focus and Audience gives you a better sense of how the different resources meet the needs of a given situation. For instance, you can see from the model that when your Focus is on Personal Growth as an Individual, you may rely on the skills of a Coach to help build confidence, improve leadership behavior and raise personal awareness. If you Focus is on Personal Growth as a Team however you may likely rely on interpersonal exercises, experiential training and various assessments to help build trust, empathy and communications within the team thus improving overall Team Health. On the other hand, if your Focus is on Entrepreneurship (the growth of your business) at an Individual level you may seek out the support of a peer-to-peer group like EO, YPO or other such groups that bring business owners together to share best practice, provide unbiased perspective and straightforward advice. However, if your Focus is on Entrepreneurship and you are looking for greater accountability and a shared vision, you would likely rely on an Operating System to keep everyone sharing the same vision, more accountable and pulling on the same rope. An insight provided by the model that struck me as particularly compelling is that EOS is uniquely qualified to help business owners address two areas within the two-by-two diagram simultaneously and this is key to its real value as an operating system. Not only does EOS provide a greater degree of accountability and shared vision in the area of Entrepreneurship, it also provides the benefit of nurturing a much higher level of Team Health by creating an open, honest and accountable forum within which the Team works. This is a powerful consideration when looking for the support required for breakthrough growth. You need all three for real growth to happen: accountability, shared vision and team health. Another way the model helps clarify things is to illustrate discrete areas of need that EOS addresses relative to others. Consider Vistage, the well-known peer-to-peer/executive coaching organization (vistage.com), for example. Concern has been raised with me by some Vistage Chairs that EOS is in competition with them. In fact, as you can see in using the model, EOS is a complement, not a competitor. Vistage provides peer-to-peer and coaching services for Individuals. EOS provides greater accountability, a shared vision and improved team health to a Team – one helps the individual, the other the team. Of course, I like EOS for its ability to move the entire team quickly to action, but both are important to any aspiring entrepreneurial company. As my close friend and colleague Jonathan B. Smith likes to say, “EOS is no more a competitor with Vistage than your CPA is a competitor with your attorney.” The bottom line is this: EOS is an operating system designed to quickly spur breakthrough entrepreneurial growth by engaging the team. This is a key differentiator in the competitive landscape and one that makes terrific sense for most business owners. Vistage, YPO, EO, WPO, TAB, Strategic Coach, executive coaching services and others are truly about the individual. They do little to change the dynamic and focus of the team. If you’re looking for a powerful approach to more accountability, a shared vision and greater team health that achieves breakthrough growth the unique attributes of EOS are difficult to beat.